I looked at my blog page and realized I haven’t posted anything in almost two weeks! That’s outrageous! Truth be told, I am feverishly working on the last issue of Amethyst which is extra long without the benefit of extra days to work on it. In addition to that I have been working on scripts for Atomic Toybox and a script for yet another project that I will be revealing as soon as DC lets me. So, what can I really tell you? Not much, except to say that the deal on Atomic Toybox is almost complete (budgeting, paperwork, contracts, etc) so I will be able to announce details on that soon. The other project that I am writing and drawing I will announce shortly as well…..I think. In the not too distant future I would like to post my process for drawing Amethyst but all of the sample art I have is on issues that haven’t come out yet so I have to wait on that as well. Sometimes I think it would be great to have a regular 9-5 job that gave me the weekends off and paid vacation time and healthcare benefits. But where’s the adventure in that? When I think of some of the other jobs I’ve worked earlier in my life (pouring concrete, picking up cardboard at Epson, making potato salad and screwing lids on horseradish), I realize the uncertainty of professional art is not too bad. 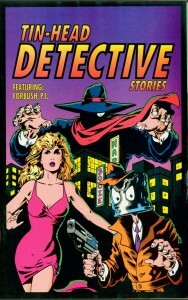 I first tried to break into comics when I was still living in Los Angeles and fresh out of USC film school. At the time I was reading scripts for Tri-Star Pictures (the job sounds better if you refer to it as a Script Analyst) until an unexpected writer’s strike took place. I had to start taking temp jobs to make money and at that point I started thinking, “You know, my childhood vision of a career in comics doesn’t seem like such a bad thing after all”. I did a few jobs for an independent publisher (who will remain nameless so you can’t look up the work) because I wasn’t good enough to work for the big boys. However, often perseverance is more important than talent and I eventually landed a gig at Marvel. 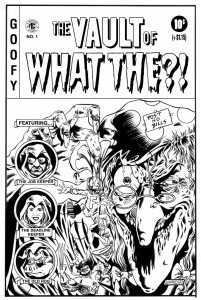 I completely tanked the job (again, it will remain nameless) but finally I found a sympathetic editor in Renee Whitterstaeter and landed a semi-regular gig writing and drawing parody stories for Marvel’s “What The…?!”. I was in the door! 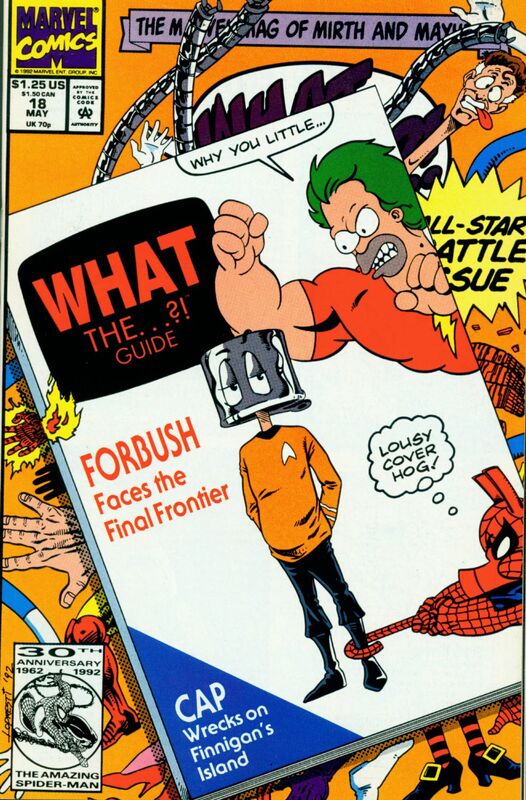 I may have been chronicling the adventures of Forbush Man but I was in! The next logical step was to convince Renee to let me do a cover. She was sympathetic but not stupid! So I had to devise a plan. That plan was the flip book. Now I am not saying I invented the flip book (although in my mind I may have) but if I didn’t I was one of the first to exploit it. 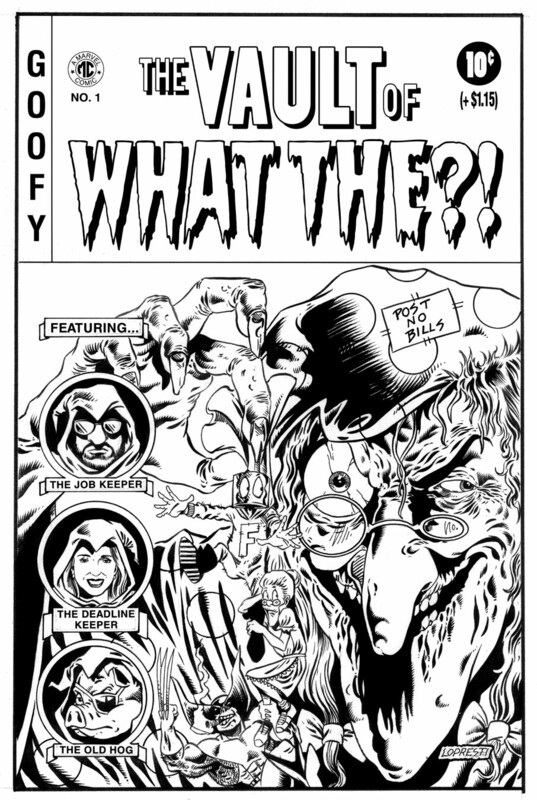 I suggested to Renee to let me do the back cover of an issue of “What The…?” as a flip book cover. So you would flip the book and my back cover would be the cover and my story would be flipped also and be the lead story. Genius! Two issues later I convinced Renee to let me do it again (I’m sure I was increasing sales). This time I really went back to my roots (Old EC horror comics) and came up with this. 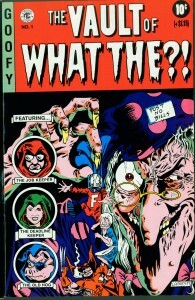 It appeared on the back of issue #16 of “What The…? 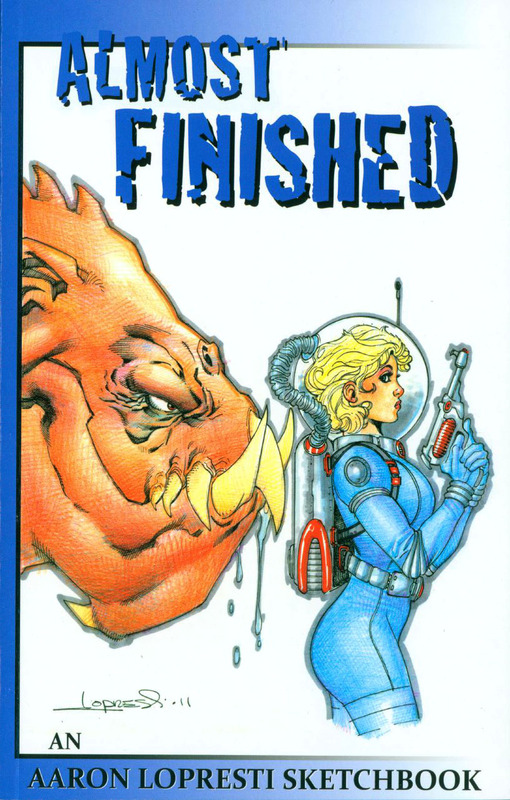 !” The three inset characters on the side bar are Tom DeFalco (former E-I-C at Marvel), Renee and the Old Hog is actually one of the logo’s for the art studio I was working for at the time (shameless plug, I know). The story that accompanied this back cover was probably my favorite that I did, “Are You Man Enough to Enter the HOUSE OF MISERY?” One good thing about doing Forbush Man stories – I was able to visti a lot of my favorite genres. I do still have the original art for this so here it is along with the printed color version. I will admit that every time I went to a department store or convenience store and saw one of these issues in a spinner rack, I would flip the book over so my cover was showing! Finally, when issue #18 rolled around, I did a Star Trek parody story and talked Renee into letting me do the actual cover. So here is my actual first front cover to a comic book! I sold the original to this one, too. What a chump mercenary I am…. Who Cares about Plastic Man? I do! Right now I should be drawing Amethyst or at least working on the script for my next upcoming DC project (that I can’t mention yet) but instead I am going to blog about Plastic Man. Yes! I grew up reading mostly Marvel Comics and was a true Marvel Zombie. However, if you looked at a stack of books I bought during that time (mid to late 70’s) you would find one odd ball non-Marvel book. Plastic Man. 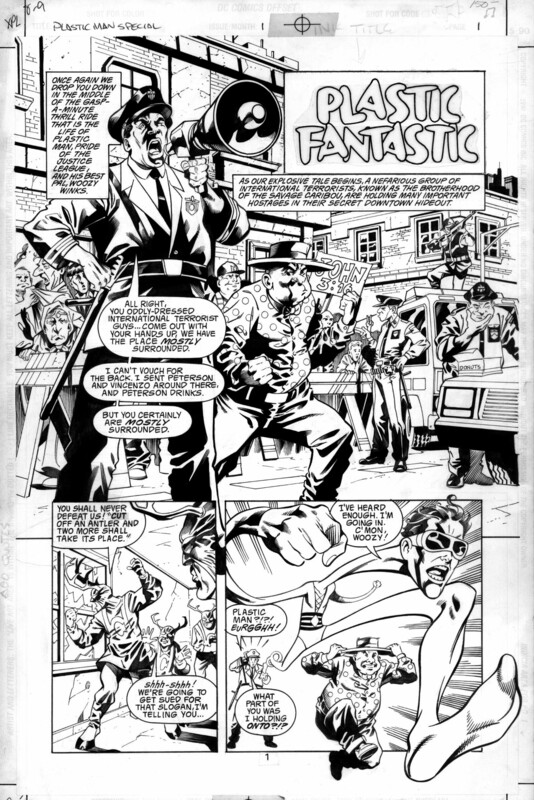 DC relaunched Plastic Man in 1976 with issue #11 (it picked up where the first DC series from the 60’s got cancelled) and I was inexplicably drawn to it. Perhaps it was just the overt goofiness of the character (one of my defining characteristics as well) or the charming artwork of Ramona Fraden or maybe it was just the fact I thought it was a first issue collector’s item but I bought it and read it multiple times. Every since that time, drawing Plastic Man was one of my dreams. (It’s really sad how frequently I am drawn to characters that don’t sell and no else cares about) Sometimes dreams do come true. Around 1999 when I couldn’t pay Marvel or DC enough to hire me (see the debacle known as Takion for the reason) I got a surprise call from old friend Tony Bedard ( I had worked with him at Valiant) or perhaps I called him begging for work. 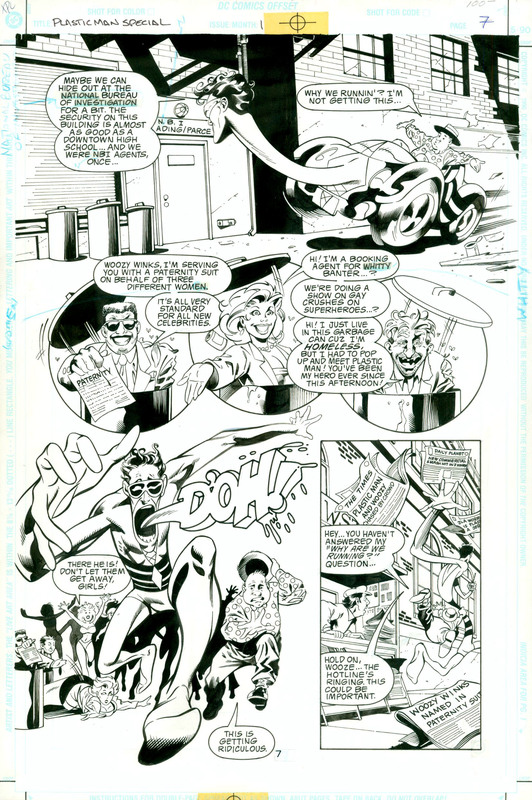 He offered me a Plastic Man story in the Plastic Man 38 page Special #1 and I was in heaven (not just because it was paying work but because it was also a “dream job”) Yes, God does work in mysterious ways. I got to ink the job myself as well which then turned a 10 page story into a 20 page paycheck! My wife and child were happy and so were my bills. It was also and still is one of the most enjoyable projects I have ever worked on. The story allowed me to be silly, irreverent and very imaginative and I guess therein lies the appeal. Superman, Wonder Woman, Batman and others have defined boundaries and are closely watched by their editorial supervisors but Plastic Man is wide open and no one is ever watching all that close. 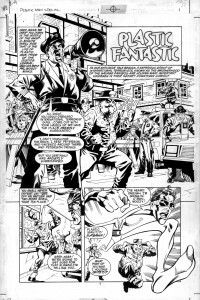 I will always look back fondly on that job (even though I could do it much better now) and I will continue to look forward to a time when I get to draw Jack Cole’s fantastic creation again. Check out these two pages from the story and believe it or not the word balloons are on the art! (man, I must be old). I am still recovering from the the wild weekend that was the Emerald City Comic Con. One day I will have to write about the best shows I have attended but for now, back to the sketchbooks. In my last entry I talked about my sketchbooks up to 2009’s Saved From The Trash. Even though I felt it was one of my strongest sketchbooks the cover image didn’t grab potential buyers so I knew I had to come back with a stronger and different product. In 2010 I tried something I had yet to explore; full color! Most smart people go to China to have their color books printed to save money but I didn’t have a connection to do that so I found a printer in the US. Since the cost of printing a full color book was significantly higher than black and white I had to change to a less expensive format. 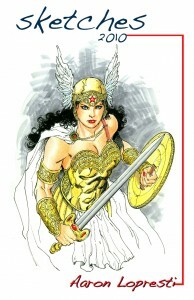 Then at the advice of fellow artist, Terry Dodson, I tried to cash in on my success as the artist on Wonder Woman by using a Wonder Woman-esque image on the cover. Again I kept the print run low at 500 copies and although the book sold better than my previous effort, it still did not move as quickly as I had hoped. This made me question the value of going color over black and white as well as the higher price tag of $15. In 2011 I went back to perfect binding and black and white and kept the print run at 500. I finally developed a female character I could put on the cover that was cute but not sexualized. Of course, I am speaking of Kit Carter, Galactic Ranger! 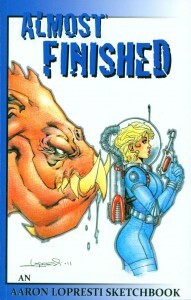 The character is really nothing more than an homage to Sci-Fi comics of the 1950’s popularized by Wally Wood. Maybe with a little retro movie serial thrown in. I dropped the price on the book back down to $10, went back to creative titling with “Almost Finished” and found it sold well but again not much different than my color effort. I took a year off from publishing thinking perhaps I was over-saturating the market and it gave me some time to think and plan a new strategy. So here in 2013 I have published my 10th art/sketchbook. This time I did few things differently. I made sure I had a really strong cover image that pops, I went back to full color mainly because I found a good affordable printer (Indigo Ink) here in the US and finally I made sure the content of the book was dynamite. After all, with a small sketchbook the cover and the choice of interior images is everything. I once again kept the print run at 500, which seems to be a good number for me. I also realized premiering a sketchbook at San Diego was counter productive. San Diego may be the biggest but it is one of the last shows of the year not the first. So by premiering a book there, it limits your opportunities for exposure through the course of the whole year. 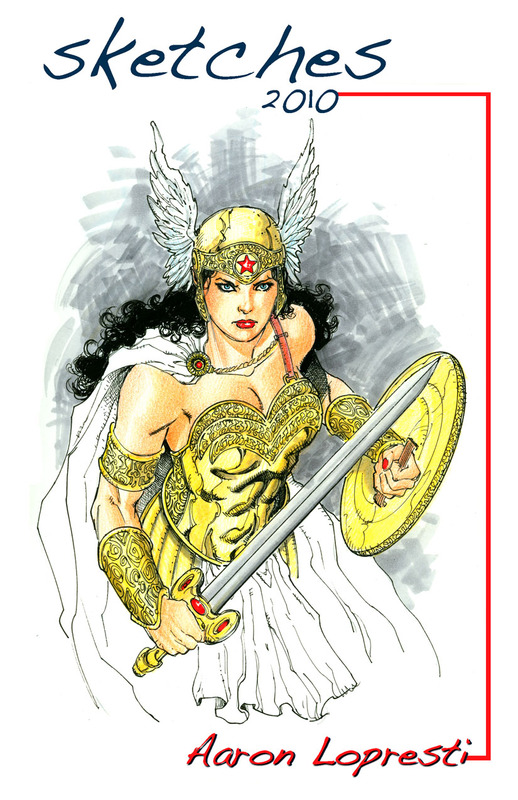 This year I published the sketchbook prior to the first major show of the year, ECCC in Seattle, and will have the book available on this website as well as with me at every show I attend this year. A quality book that is readily available makes the most sense. Considering I have sold almost 100 copies in less than a week, I would say I may have finally learned something. All three of these books and more are available for sale right here on this website!